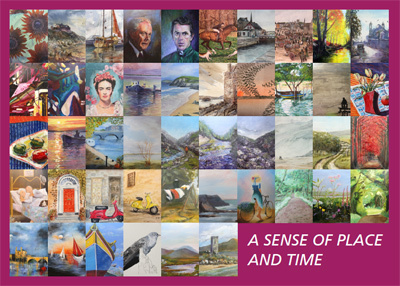 Luan Gallery is thrilled to announce its Christmas and New Year exhibition entitled: A Sense of Place and Time featuring the work of Athlone Arts Group which opens on Friday 8th December at 6pm and continues until 2:30pm on Sunday 28th January 2018. The exhibition features forty six art works from nineteen artists living in Athlone and will be shown across all three spaces at Luan Gallery. The show seeks to explore landscape, people and objects reminiscent of both present and past, both fantasy and realism. Athlone Arts Group is now in its 35th year and is one of the oldest and most successful community art groups in the country. It has a very active membership and meets regularly to practice, have tuition from established artists, attend lectures and visit museums. The group has greatly contributed to the cultural landscape of Athlone and County Westmeath over the years. "A Sense of Place and Time encapsulates where we are now and where we came from whilst inviting the onlooker to evoke memories of days gone by and stir the imagination." The artists' work showcases a varied selection of painting techniques including; chalk and decoupage, linocut mono print, pen and ink, oil, acrylic, and watercolour. The diversity of the techniques used highlights the connection to nature and the things that surround us, our fascination with beauty and the objects of nostalgia that bring us closer to times past. A Sense of Place and Time will be launched on Friday 08th December at 6pm at Luan Gallery with a wine reception and all are welcome. Mayor of Athlone Cllr. Aengus O'Rourke will commence the proceedings and the esteemed Athlone Playwright and Novelist, Jason Gill will formally open the exhibition. The exhibition will continue until 27th January 2018. Luan Gallery is open Tuesday – Saturday from 11am – 5pm and Sundays from 12pm to 17pm. The gallery is closed on Mondays.